Since the emergence of identifiable human society, the quest for knowledge has been a prime concern. The idea that the viability of civilization, indeed the very future of mankind, depends heavily on acquisition of knowledge permeates our national consciousness from the level of the federal government, to working mothers and fathers who assume enormous financial burdens in order to educate their young. In view of the obsession with the pursuit of knowledge, it is reasonable to suppose that everyone understands clearly what it is that they are pursuing. Actually, few people, educators included, have any idea of what knowledge really is. Exactly what does a parent expect his child to receive in exchange for the $20,000/year tuition charged by the best American universities? Let's ignore the obvious advantages in career opportunities available to students in professional schools. What does the undergraduate English or History major, or the graduate student in Philosophy have to show for his efforts? For that matter, what are all those professors doing with their time? What do they produce that entitles them to a good salary, excellent benefits and lifetime job security (tenure)? Everyone engaged in the great education enterprise, consumers, purveyors and managers will, of course, respond with a common voice that the obvious answer to all of the above is "knowledge". This answer, however, is not correct. The correct answer is "ignorance". In fact, all of these people are occupied with the quest for ignorance. Although this assertion may appear outrageous, my intent is neither to shock nor to amuse. I simply wish to underscore the fact that the terms "ignorance" and "knowledge" define conditions that are very poorly understood. Before proceeding, it must be emphasized that the ignorance and knowledge that we are concerned with here do not include technical or practically applicable categories. No one would dispute the benefits of serviceable knowledge acquired in medicine or science and engineering. The type of knowledge (and ignorance) that we are considering embraces the fundamental truths of existence, which is to say that it addresses the nature and meaning of reality. What are we? Where are we? Why are we here? It seems self-evident that ignorance is bad, knowledge is good, and that we must eradicate the former by replacing it with the latter. On close scrutiny, however, the situation is not that simple. Ignorance is a complex multidimensional condition. There are at least four varieties of ignorance, two of which are beneficial; one of these actually supersedes knowledge in the enlightenment that it confers upon those who attain it. Moreover, the view that knowledge proceeds from, and replaces ignorance is not necessarily correct. The ideal progression is one in which ignorance displaces knowledge. Let's begin with the four classes of ignorance: passive ignorance, active ignorance, essential ignorance, and enlightened ignorance. We will delve into the limited, albeit important, role of knowledge later. Passive ignorance is easy to understand and easy to come by. It's what fills a person's head after a lifetime spent in front of a television set. It is the inevitable and automatic outcome of doing nothing with one's mind. Passive ignorance is abhorrent to almost everyone, and people spend the first 20 or so years of their lives in the classroom in order to immunize themselves against it. It is a given that the antidote to passive ignorance is knowledge, and knowledge is presumably best acquired at university. Much of what the university has to offer, however, is another variety of ignorance, active ignorance. Active ignorance is commonly mistaken for knowledge, so that although we imagine that we go to school in order to fill our heads with wisdom, we are really there to exchange one type of ignorance for another. Active ignorance is particularly deceptive because it parades in academic trappings. Moreover, it often reflects immense scholarly effort and occasionally, true creative brilliance. It is, nonetheless, false, and its effects are as pernicious as those of passive ignorance. This paradoxical type of ignorance can best be appreciated through an example. In my first year of graduate school (over thirty years ago), I took an advanced course in Neurophysiology given by scientists actively engaged in cutting-edge research. Following a stunning series of lectures describing how the circuitry of the brain encodes and analyzes visual information, the professor ended his presentation by pointing out that since we are now able to understand visual experience in terms of specific patterns of neuronal activity, eventually, we will be able to explain all conscious experience in similar terms. Thus, we can finally put to rest the childish superstition that life and consciousness are the product of some preternatural entity called the "soul." A surge of exhilaration swelled through the class as the primitive idol of soul-belief crashed in shards. The students felt themselves participants in an historic victory in man's struggle with darkness. For me, however, this magnificent triumph raised a thorny question. Like my classmates, I had never seriously entertained the possibility that souls exist. Now I wasn't so sure. It seemed to me that the professor had really presented a cogent argument for the existence of the soul. He had shown that the brain encodes visual stimuli in orderly patterns of electrical activity, which are then integrated and processed in various ways. Viewing the color blue, for example, would ultimately evoke an electrical code, in a circumscribed region of the brain, that would then be interpreted, and subsequently experienced as "blue." The obvious question is who reads the code? Who translates a pattern of electrical impulses into the conscious experience of color or pain or sound? It can't possibly be the brain itself, because the brain is only capable of generating and integrating electrical activity. Clearly, there must be something supracerebral that deciphers and transforms these electrochemical messages into conscious subjective experience. In short, there has to be a soul of some sort. I was thrilled with this discovery (being unaware that Sherrington arrived at a similar conclusion some 30 years before), and I hastened to the office of the great savant to tell him of my find. With heavy sarcasm, he ridiculed my proposition as absurd. I persisted and asked him to point out where the argument was flawed. He lost his patience and dismissed me from his office. I was hurt and confused. Since I sincerely wanted to know the truth, I would have been happy if he had shown me the error in my reasoning. It was only much later that I came to realize that he was neither interested in, nor capable of refuting the logic. In fact, logic and truth played no role in his thinking. Lurking within that supremely confident, scientific, erudite exterior was a fearful, irrational, child. We imagine that our attitudes are fashioned and informed by knowledge. We assume that our view of ourselves, and of life in general, is the evolutionary product of years of progressive intellectual edification. Unfortunately, this is hardly the case. Our concept of existence is molded primarily by sub-rational fears, emotional addictions and primitive appetites. We do not use our minds to search out the truth, but rather to create "truths" that will alleviate our fears and justify our desires. The hero of the above story was not interested in establishing the basis of conscious experience. He was, from the outset, fervently committed to the belief, as are many educated modern secularists, that man is no more than a machine made out of meat, a biochemical accident generated by a vast purposeless universe indifferent to his existence. From where does such a conviction come? It is not a product of the mind but rather of the hormones. People dread the unknown and the mysterious. It is a great comfort to be able to visualize oneself exclusively in terms of comprehensible physical laws and processes. Moreover, as long as an individual sees himself as a collection of chemicals, in principle, no different than that which constitutes a dog, he can feel free to behave like a dog. The alternative to the materialistic/secular outlook raises some alarming possibilities. What if there is a soul? Might there not also be a G‑d? Are there perhaps consequences to saying, and doing, whatever one feels like? The value of active ignorance is that it shields the modern secularist from such questions. Society, therefore, looks to the producers of active ignorance, the academics, to demonstrate that consciousness is no more than electrical activity, that life is a chemical reaction, and that your ancestors were, if not dogs, at least apes. Active ignorance provides a compelling pseudo-intellectual belief system that insulates us from life's mysteries, soothes our anxiety, and validates our selfish animalistic drives. If the ultimate goal of the secular world is active ignorance, that of the Torah world is enlightened ignorance. The process leading to enlightened ignorance does not begin with passive ignorance but rather with a condition called essential ignorance. Essential ignorance is not a lack of awareness, but rather the awareness of a lack, and as such, it renders the mind an empty vessel prepared to receive. Without bittul, the mind cannot function as a true vessel to admit wisdom, because its standards of admission are distorted by bias, emotional needs, background, and habit. Essential ignorance motivates individuals to pursue truth regardless of the cost or the consequences. An awareness of essential ignorance swept through American Jewish youth in the sixties as the motive force driving the nascent Baal Teshuvah movement. Assimilated young people avidly and truthfully sought knowledge of Torah, despite the cost in inconvenience, family conflicts, and social disruption that often followed. Essential ignorance is the obligatory starting point for anyone seeking truth. This can, perhaps, best be appreciated through an analogy. Let's consider an individual grappling with an intractable problem in the Talmud. Once the scholar has clearly identified the difficulty, he assaults it with every solution available in his intellectual arsenal. After a period of apparently fruitless effort, a phase of confusion ensues in which the scholar feels totally lost. It seems to him that he had a clearer grasp of the question at the beginning of his quest, and that he is now farther than ever from the truth. When one reaches this distressing stage, the resolution to the problem is immanent. The scholar may be riding on a bus, eating dinner, or shining his shoes when, out of nowhere, in a flash of insight, the answer will occur to him. The period of bewilderment experienced by the scholar is the bittul of essential ignorance. The scholar had tackled a subject that transcended his present capabilities. The cognitive processes, which in the past had served him so well, were now not only ineffective, but obstructive. During the stage of essential ignorance, the intellectual capacities on which he had heretofore relied, and which now shackled him, disintegrated, leaving him with nothing. Indeed, another Chassidic expression for essential ignorance is ha'ayin be'emtza ("the nothing in between"). Although this self-nullity is a painful experience, the dismantling of restrictive thought patterns liberates the mind and allows new intellective processes to emerge. In a sense, through attaining the self-negation of essential ignorance, the seeker of wisdom is able to create a new mind for himself. Although it would appear that the ultimate purpose of this process is the acquisition of knowledge, such is not the case. The utility of the knowledge acquired at such exorbitant expense is of exceedingly short duration. The primary value of new knowledge is that it raises new questions and drives the seeker of truth to move on. It is not uncommon, for example, for scientists to commit enormous resources and time to the solution of what seems to be a seminal question. When, following immense effort, the answer is obtained, it usually generates a mélange of fascinating new questions before which the "old" question pales in significance. In like manner, the answers to these crucial "new" questions will become obsolete and discarded within nanoseconds of their discovery. The analogy, of course, is not really comparable to the analog. In the realm of Torah, there is infinite and absolute value to everything learned. Our purpose at the moment, however, is to consider the progressive sequence of intellectual stages on the path to conscious personal recognition of truth. What then, is the point of acquiring knowledge? The point is that just as essential ignorance is necessary to obtain knowledge, knowledge is a prerequisite to attain the ultimate goal of enlightened ignorance. It is hard to imagine that time and exertion properly spent in the quest of truth culminates in ignorance of any sort. Moreover the term enlightened ignorance is self-contradictory. How can ignorance be enlightened? Since enlightened ignorance surpasses knowledge and wisdom, it is not knowledge or wisdom, which is to say that it is a form of ignorance. However, unlike essential ignorance, which precedes knowledge, enlightened ignorance supersedes knowledge. It is the great "I don't know" as opposed to the simple "I don't know" of essential ignorance. Some time ago, I approached a profound and accomplished scholar with a query in Chassidut. He pondered the question for some time and replied "I don't know". The gaze of his eyes reflected the awe and wonder with which he held the subject. I could not begin to imagine how much knowledge, wisdom, and enlightenment lay behind that "I don't know". On the other hand, had I asked my 12 year old daughter the same question, I would have received the same answer. The difference, however, is obvious. My daughter simply doesn't know. My scholarly friend, on the other hand, knows why he doesn't know and why he can't know. His intellect has developed to the point that he can sense, almost experience, the ethereal nature of the subject. Enlightened ignorance is as far as one's mind can take one in the quest for truth. Intellect, even of the highest quality, is, by nature, limited. The Divinity that is the foundation of existence, on the other hand, transcends limitation, definition, or description. Enlightened ignorance is the informed realization of this fact. It is knowing clearly, as opposed to believing, that one cannot understand G‑d, nor can one understand His attributes such as wisdom, justice or mercy, His ability to create existence from naught, the means whereby He conceals His will in natural law, etc. In short, enlightened ignorance is a gateway to emunah ("faith"). All of this now raises an obvious question. Why bother? Every Jew is endowed with emunah by nature. Consider the hundreds of thousands of martyrs who died al kidddush Hashem in the crusades and in the Chmielnitzki massacres, or the cantonists who exhibited extreme self sacrifice to maintain their Judaism in the harsh ranks of the Czar's army. How many of these holy Jews were knowledgeable in, much less motivated by complex and subtle theosophy? The fact that we invariably use such examples to describe emunah is the best argument for our current need of enlightened ignorance. The fact is that we are, for the most part, not called upon to sacrifice our lives for our faith in G‑d. It is unlikely (at least for the present) that the average householder living in Boro Park or Crown Heights will be required to choose between apostasy and the stake. 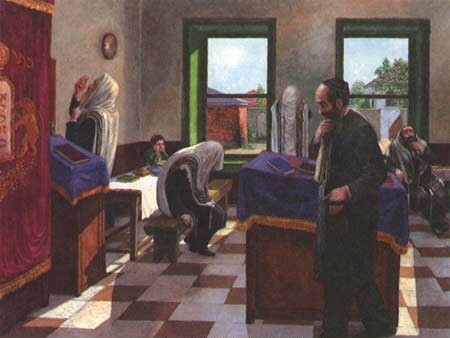 How, then, do Jews living securely in the comfortable galut of America, engaged in ordinary occupations, draw the fire of emunah into their daily lives? Everyone, of course, has their troubles, and we are thus forced, from time to time, to rely consciously on G‑d. But why wait for trouble? And why waste the power of emunah on the relatively trivial exigencies of material life? Enlightened ignorance allows us to appreciate the constant direct involvement of the Creator in our seemingly ordinary lives. It forces us to contemplate that, contrary to all reason, our commonplace activities as Jews, such as donning tefillin or depositing a coin in a pushka (charity box), have eternal cosmological consequences. Enlightened ignorance draws the wonder of emunah into our most prosaic activities. It makes us realize that nothing is purposeless, everything is miraculous, and it infuses our Torah and mitzvot with awe and joy. It forces us to be aware that we are living with G‑d. The effort that goes into achieving enlightened ignorance also prevents us from squandering emunah on issues that are amenable to reason and knowledge. One does not, for example, require emunah in order to accept the existence of G‑d or the fact that He runs the universe. These things are knowable. Emunah definitely need not be invoked to deal with the theory of evolution, referred to in Jewish apologetic literature as the "Akeida of the intellect", the age of the universe, or life after death. It is not uncommon for students who are plagued with questions in these areas to assume that they are losing their emunah. Nothing could be farther from the truth. They simply have not learned enough, nor have they been taught to appreciate what real emunah is. Although enlightened ignorance provides access to emunah, it is not, itself, emunah. Moreover, since it is situated at the interface between knowledge and emunah, it can just as well be classified as a type of knowledge, albeit one that exceeds the boundaries of structured thought. In fact illuminated ignorance is referred to in Chassidic literature as yedias hashlilah, knowledge by negative inference. We can now return to our original question. All agree that the pursuit of enlightenment is a primary goal in life. But exactly what is it that we are pursuing? From the Torah perspective, it is clear that our connection with ultimate reality, the Creator, can only be realized through emunah, and that the entire cognitive process is directed toward this end. Essential Ignorance This was one of the best written descriptions for active knowledge acquisition I have ever read. "I don't know" should become a teachable topic at all U.S. universities. Not really searching for hard answers you see? Thanks I really appreciated this article. Until now, I was taught to think critically about the world around me. Now I know that those evil scientists were just conspiring to spread their atheist ways. How deceptive of those scientists to offer testable, repeatable, or observable explanations for natural phenomena. Boy, what a waste my education was! You found the words for what we know, but did not have the words to say. Thank you so much for putting a structure around our knowing. "In fact, logic and truth played no role in his thinking. Lurking within that supremely confident, scientific, erudite exterior was a fearful, irrational, child." I respect your essay, it is an excellently clear exposition of the 'root of all evil'. I am also intrigued by the jewish angle you offer, as I have to confess my limited knowledge of your faith. However I would query your decision that the soul must exist. There are many possible theories that could account for our individual subjectivity (your teacher was indeed a fool). Also, after Camus, I would call your transcendence of reason a form of 'philosophical suicide', whereby you negate reason in order to eliminate the tension between our impassioned metaphysical questioning, and the indifferent silence of the universe. I am drawn to your essay and will quote it in the Rosh Hashanah edition of our newsletter, The Beth El News. It just happens that 30 years ago I was sitting in a lecture hall with a friend studying neurophysiology at Ann Arbor. I have always tried to cultivate a childlike openminededness in spit of the trouble it brings me. People do not respect it. However, I find delight in viewing the world that way. I do not want to "plug my work" but in your field you might happen on to a stereology book that I completed for a man who himself cultivated that view. It permeates his work. (Hilliard (deceased) and Lawson, Stereology and Stochastic Geometry, Kluwer 2003) Read through the problems more than the text. Interesting article I find this article interesting on many levels, least of which is its capacity to demonstrate different tendencies toward knowledge. In many ways, the discussion of a cultivated or "illuminated ignorance" engages a long debate in the humanities regarding the ignorance of wisdom. In fact, Socrates is our primary contributor to this hypothesis. As the Oracle led him to believe, he was the wisest because he perceived himself as ignorant. I think this is a very important lesson to learn. My own experience concurs. The most important knowledge I have learned in college and graduate school is how much knowledge I don't have, and how the knowledge I do have could be wrong in the first place. This has led me to believe that any dogmatic assertions or adherence to doctrines may also be an ignorant proposition. For me, it follows that an all-encompassing skepticism inevitably leads to the rejection of any strong principles.